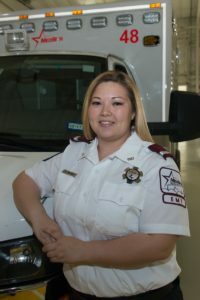 Elizabeth has been an EMT at MedStar for three years. Elizabeth has always had a passion for caring for people and a career in EMS has always been her dream, even as a small child. Once Elizabeth was old enough, she began working in local hospitals to gain the patient care experience necessary to apply for a position at MedStar. Elizabeth loves helping people, and enjoys the daily excitement and fun that every shift brings! Elizabeth is currently in Paramedic school and looks forward to advancing her career with new clinical skills. Elizabeth also acknowledges the hard moments in EMS. Elizabeth remembers her most difficult call as being a very tragic child abuse case that resulted in a child suffering a cardiac arrest, as she and her partner worked feverishly to save the child’s life. Elizabeth was nominated by her peers to represent MedStar as a Star of Life.